The launch event video had a reach of 19,712. On the ACT Policing Facebook page, the campaign achieved a total combined reach of 93,031. Helping ACT Policing ‘Keep Summer Safe’. 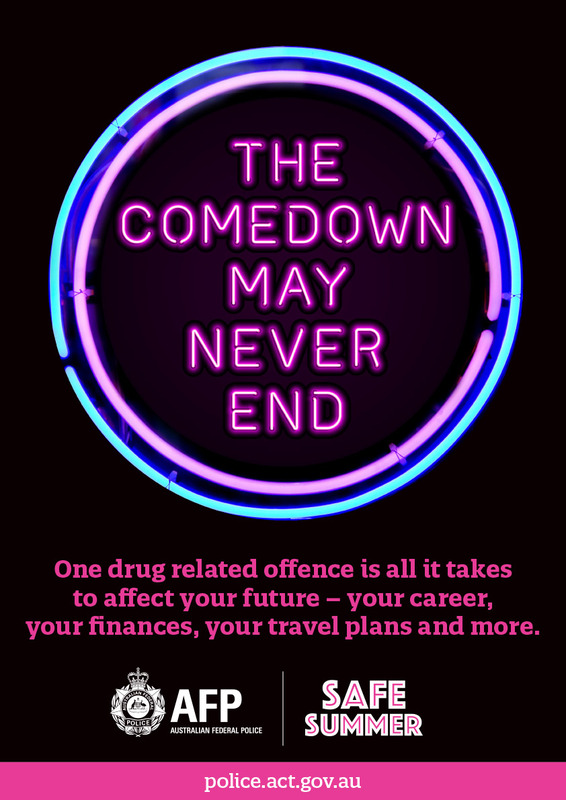 The ACT Policing annual ‘Safe Summer’ 2017 campaign needed to raise awareness of receiving a Criminal Infringement Notice (CIN) to an audience who are traditionally sceptical of the policy-makers. NATION delivered a campaign with the focus of changing audience perception and behaviour by using wry humour and vibrant colours to sidestep cynicism, with messaging focused on financial loss associated with receiving a CIN because this was the most relevant disincentive for the target audiences. The campaign creative ran across posters, coasters, pull-up banners and social media assets. 1000 posters and 104,000 drink coasters were distributed along with the digital content for websites and television screens to 70 licenced venues. Canberra Police conveyed the materials had high uptake amongst venues, and were effective in context. Increase awareness CINs and their resulting fines. Create a campaign that will work in the context of a pub or club environment. Strong campaign look and feel that is flexible enough to allow targeting of different public audience groups. Helping ACT Policing Keep Summer Safe. 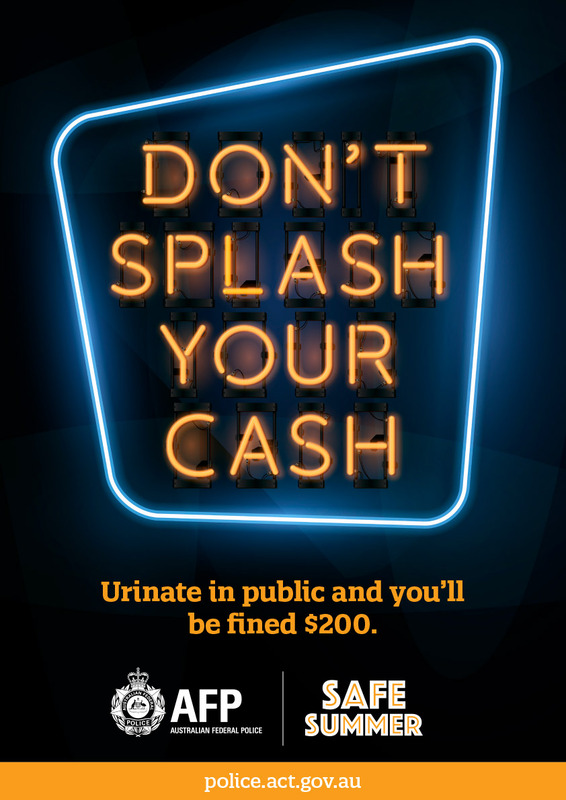 The ACT Policing annual ‘Safe Summer’ 2017 campaign needed to raise awareness of receiving a Criminal Infringement Notice to an audience who are traditionally sceptical of the policy-makers. NATION delivered a campaign with the focus of changing audience perception and behaviour by using wry humour and vibrant colours to sidestep cynicism, with messaging focused on financial loss associated with receiving a CIN because this was the most relevant disincentive for the target audiences. 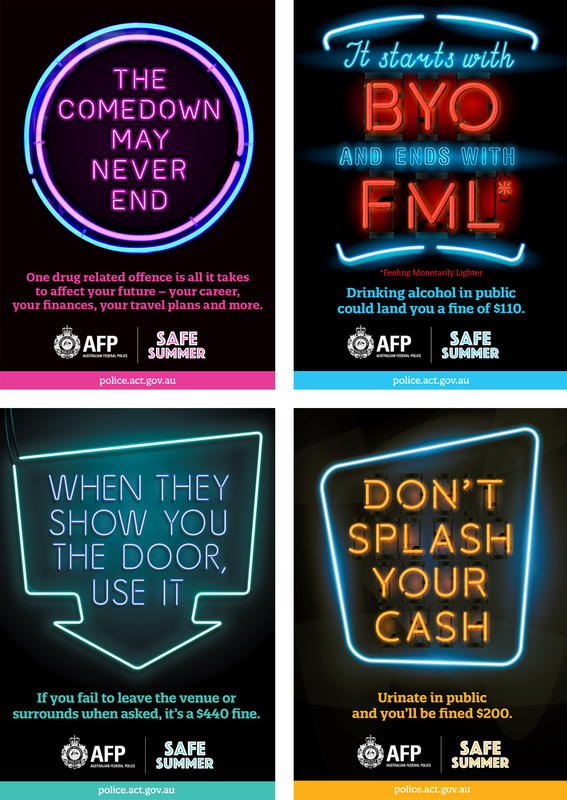 The campaign creative ran across posters, coasters, pull-up banners and social media assets.